Yonatan Shapira says Israel’s ‘democracy’ is in fact an apartheid state led by fascist Jewish supremacists. DIMITRI LASCARIS: This is Dimitri Lascaris, reporting for The Real News Network from the port of Naples, Italy. We are seated in front of the ships of the Gaza flotilla, the Freedom Flotilla, which have been docked here for a couple of days, and I’m pleased to be joined today by Yonatan Shapira. Yonatan is a former rescue pilot in the Israeli Air Force. He’s also a founding member and prominent activist of the Israeli movement Boycott From Within. And I’d like to thank you very much for joining us today, Yonatan. YONATAN SHAPIRA: Thank you. Thank you for coming. DIMITRI LASCARIS: So I’d like to start by talking about your experiences within the Israeli Air Force, and your decision ultimately to become a dissenter from military service. Could you tell us about that? 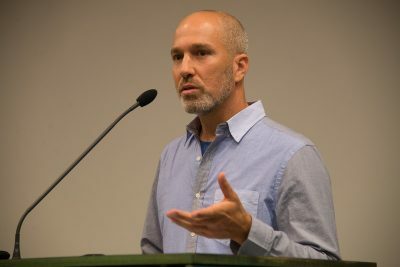 YONATAN SHAPIRA: Well, there is a long story to tell here, but I’ll just try to say in a few words that in 2003, after more than 10 years of service in the Israeli Air Force, I was a Blackhawk helicopter pilot doing rescues and flying soldiers, and doing everything that I was asked. I realized together with other friends in the air force that we are fighting for the wrong side, and we are part of an organization that commits a crime against innocent Palestinians, and we do not want to be part of it anymore. So together with a group of about 27 pilots from all different squadrons of the Israeli air force, attack pilots, rescue pilots like me and others, veterans and active, we send this letter to our commander and the whole society in Israel telling them that we are no longer willing to obey the orders and be part of this illegal and criminal, immoral, occupation. That’s what started my life as an activist fifteen years ago, on the eve of the Jewish year, Rosh Hashanah. DIMITRI LASCARIS: And subsequently you became a prominent member, as I mentioned, at the outset of this movement, Boycott From Within. Can you tell us, what is it like being an Israeli citizen advocating for the imposition of a boycott given the attitude of the Israeli government towards the whole boycott movement? YONATAN SHAPIRA: As a human being, I’m very proud of it. I feel super confident about what we, we are many activists. We are still a minority of a minority. But there are activists in Israel who are calling for boycott, divestment, and sanctions because we believe it’s for the benefit of all people; Palestinian people, and Jewish people, and everyone living there and everyone in the world. Of course, the Zionist society in Israel doesn’t like it. So you pay the [little] price of being a dissenter in an apartheid. So you get some benefit, some of your privilege away. But overall I’m still able to be there when I’m there, and lead a relatively comfortable life. And slowly, slowly, the apartheid system is trying to make it harder and harder and more difficult on us. But again, when I look and compare my life to the life of a Palestinian or a refugee in Israel, or even a non-white Ashkenazi Israeli man in Israel, I’m still able to live quite comfortable. As we speak there are many trying in Parliament to make the apartheid in Israel more official. So different laws that are trying to constitute, that will make it even harder for us to still be free to still act. And it’s just important to remember that Israel claims to be a democracy. It is not. It’s, it’s an apartheid. It’s led by a group of fascist Jewish supremacy people, and prime minister, and ministers. But if you’re a Zionist Jew, you can feel great democracy. If you are not a Zionist, and if you’re not a Jew, you’re living in apartheid. DIMITRI LASCARIS: Now, you’ve participated in prior missions of the Freedom Flotilla. Could you tell me why, and also how you were received by your former colleagues within the Israeli military when the vessels were intercepted on those occasions? YONATAN SHAPIRA: The first time I tried to break the blockade with a group of activists was 2010. About three months after what happened on the Mavi Marmara, where Israeli, the Israeli army shot and killed about 10 activists from Turkey, most of them. The helicopter that landed, the soldiers that killed and massacred people on the Mavi Marmara, were helicopters from the squadron I used to fly in, this Blackhawk squadron in the Israeli air force. And therefore I decided that I must participate in the second boat that will try to break the blockade. It happened in September 2010. We were very small, and we were intercepted by many warships, small and big. And if we were Palestinians or Turks I guess they would shoot us and kill us, maybe, but I got the better treatment of a Taser gun in my heart. So maybe they thought that they will resuscitate my Zionist behavior. My Zionist heart will start beating again. But instead it just made me more clear about my decision, and confident about the need to struggle against apartheid and against this illegal crime of ghettoization and that concentration of two million people. The second attempt was 2011, a year, about a year later. I was on a crew of The Audacity of Hope. It was a big American boat, and we were part of the second flotilla trying to leave from the port of Piraeus in Greece. Unfortunately, the Greek government was coopted by Israel and the U.S., and with different pressure, I guess, they obeyed Bibi Netanyahu. And we had a big sign saying, who’s your commander, Netanyahu or Poseidon? Who is the god of the sea. Is it Israel, or the Greek Poseidon? Unfortunately, it was Netanyahu and on a gun show on a gunpoint. We were stopped by the Greek coast guard just a few minutes after leaving the port of Priaeus, and we had to go back, and were detained by the, by the Greeks. And the third attempt was 2012, with the Ship to Gaza, the Swedish group that was with many international organizations, and the Finnish flagged boat. We had other Israelis on board. And we were also stopped about 40 miles from, from shore, from Gaza. This time it was a big operation. I guess they used it as a maneuver for training their forces, because they know that we are not posing any threat, like military threat, on them. So they were hundreds, maybe thousands of soldiers participating. About 15 warships, big and small. And also one Blackhawk helicopter that came in circled above us. And when I looked at it on the tail I could see that the number on the tail is 852, which is the same helicopter, tthe same piece of metal that I used to fly some years before. They again arrested us, tasered us, and took us to the Navy base of Ashdod, and we spent a few days arrested. DIMITRI LASCARIS: I’d like, I’d like to talk to you about the future, to conclude. And you know, those of us in the West watching with trepidation what’s happening seem, it seems to be that every day the predicament of the Palestinian people is worse, and that the Israeli government’s sense of impunity is on the increase, if anything. Do you, are you feeling hopeful, based upon what you see, for the cause of Palestinian justice, justice for the Palestinian people? Do you see signs that this is a battle that is being won, ultimately, and that this is something that may actually be won within your lifetime? YONATAN SHAPIRA: Well gives me hope is nothing about the governments and the system that controls us in your country, in my country. I see a lot of hypocrisy all over Europe and elsewhere, and also Canada. What gives me hope is to see the popular struggle of Palestinians that are showing incredible bravery. That reminds me what I grew up on, you know, the struggle in the ghettos, in the Warsaw Ghetto, in other ghettos. With the, with all the courage to walk into the fence, towards the fence of this biggest prison in the world, without bearing any arms. Walking and trying to protest this siege. It gives me a lot of hope, because I think that’s where the mighty power of the Israeli military collapses, when we have thousands and thousands of Palestinians that are uniting, holding hands and standing in front of the Israeli snipers. That gives me hope. That means that it’s not going to be able to last forever. And things like that gives me hope to be together with the Spanish, Italians, Americans, Canadians, Norwegians, Swedish, everyone. It means that somewhere on a deep nerve of many people around the world, it’s quite clear that this symbolic struggle of the Palestinians for freedom will be won at some point. And our job is to not be deterred, and not be, not lose our hope when we see the hypocritical governments in one hand saying something against Israel’s crimes, and on the other hand still doing arms trade with them and giving them all the impunity and all the actual support to continue with this massacre and this illegality. But it’s important to to say to everyone who listens to us that we need you. We need the person that now maybe sits in Canada, or in the U.S., or in elsewhere in Europe, or somewhere else. We need you to join this struggle. And this struggle is not just about freedom for Palestinians. It’s about the struggle against what Europe and the U.S. and other countries are doing to refugees that are trying to escape the horrors in Africa. It’s the same struggle. It’s the struggle of the people who have less to be recognized and to get their basic human right. So if you want to be part of the struggle, wherever you are, you don’t have to come all the way and join us in this flotilla. You can be active on your, in your local community, for justice for, for everyone. And then you are part of the struggle for justice for Palestine. DIMITRI LASCARIS: I’d like to thank you very much for speaking with The Real News today, Yonatan. It’s been a pleasure. YONATAN SHAPIRA: Thank you for coming here. And good luck with your health. DIMITRI LASCARIS: Thank you very much. And this is Dimitri Lascaris, reporting for The Real News from Naples, Italy.